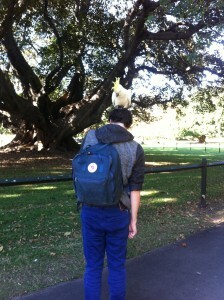 Peter Broderick » Blog Archive » down under! it’s my first time in australia. the first day i was here i took a walk with caitlin park through the botanical garden. 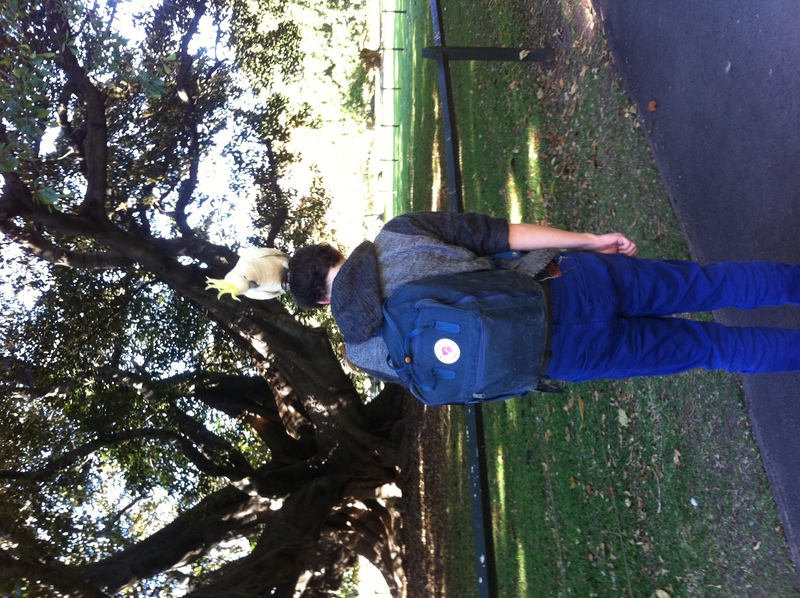 i was offering this friendly cockatoo a scrap of bread, and he came and landed directly on my head! and he didn’t even take the bread. ha! for anyone in melbourne, i will most likely play a few songs on the guitar in a record store on june 2nd. if this gets confirmed i’ll post the details in a comment on this post. and for those of you in sydney, please come to the opera house on saturday night! i’ll be performing with efterklang and the sydney symphony orchestra, premiering all new material from the forthcoming efterklang album, piramida. rehearsals the last couple days have been incredible. hope to see you there! This entry was posted on Friday, May 25th, 2012 at 6:20 am	and is filed under News. You can follow any responses to this entry through the RSS 2.0 feed. You can leave a response, or trackback from your own site. june 2, 3pm at polyester records! so far i only have a guitar, so it’s going to be quite simple. if anyone has a violin or a banjo they want to bring, i’d love to play a song or two on one of those! oh yeah, if you bring that i’m i’ll play human eyeballs for you!!! perhaps you could show up around 2:30? i enjoyed it too!!! the keyboard worked perfectly. you’re a hero! i’m sitting in the airport now, quite sad about leaving this lovely country. see you next time! please come back and play at the opera house all by yourself with the orchestra next time, not that i don’t like efterklang but i would have preferred a peter broderick concert myself! …….wahhhh, too late he cried. Damn, missed it – come back & do a you gig or two. Wahhhh! I missed your shows too – please come back down under… & next time make sure you come to Tas-vegas, the jewell of an island to the south of Melbourne.